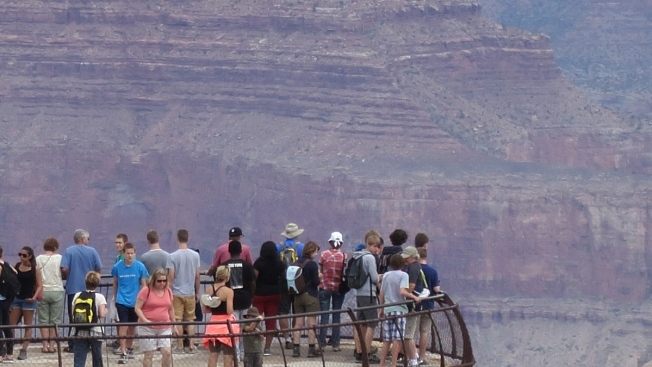 Visitors stand at the Grand Canyon South Rim on July 14, 2014, at Grand Canyon National Park, Arizona. Following the deaths of two people in separate incidents at the Grand Canyon this week, experts said that while such tragic cases are still incredibly rare, national parks have been dealing with a higher number of visitors with fewer resources, NBC News reports. On Thursday, a visitor with a tour group at the Eagle Point observation area of Grand Canyon West fell over the edge while taking a selfie, a park spokesperson said. Meanwhile, authorities at Grand Canyon National Park were working to identify the body of a person found Tuesday. While the details of both incidents remain unknown, experts said that officials are working to keep people safe by putting up railings, posting warnings signs and having staff inform the public of dangers. But the parks are also working to do so amid declining resources.